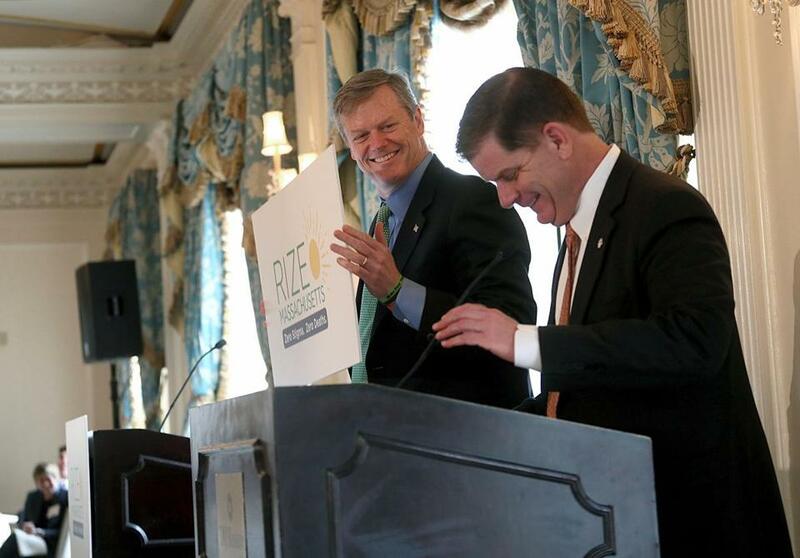 Governor Charlie Baker and Mayor Martin J. Walsh of Boston were both on hand for the launch of RIZE on Tuesday. Both have made fighting opioid addiction a top priority in their respective administrations. Opioid addiction is a tough enemy to fight, but public officials are hoping for a growing army of private-sector allies in the battle as a new group seeks to raise $50 million to address the problem. The launch of RIZE Massachusetts drew a mix of business leaders, elected officials, and health care professionals to the Taj Boston hotel on Tuesday morning to rally behind the cause. The first donors include General Electric, Partners HealthCare, Blue Cross Blue Shield of Massachusetts, and the 1199 SEIU health care union. Together, they’ve committed nearly $13 million, and they’re looking to other local corporate donors to help raise the rest during the next three years. The money will be doled out in the form of grants for a variety of causes aimed at curbing the devastating effects of opioid addiction, including community-based prevention efforts, medical treatments, and education efforts. 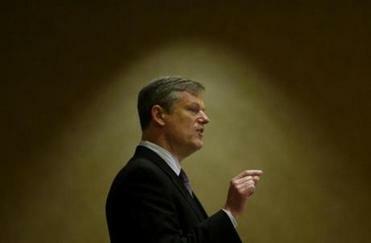 RIZE’s launch drew three of the state’s most prominent politicians: Governor Charlie Baker, Mayor Martin J. Walsh of Boston, and Attorney General Maura Healey. All three have made fighting the opioid epidemic a top priority during their first terms in their respective offices, and all three gave impassioned speeches about the cause’s urgency on Tuesday. The morning’s most powerful moment, though, came from a woman who is now a recovery coach at Massachusetts General Hospital. Raina McMahan told of how she had her first taste of heroin at age 15, then struggled with addiction over the years, trying everything from changing jobs to taking up running. Finally, it took a sympathetic doctor at MGH after a trip to the hospital’s emergency room for McMahan to take effective steps to treat her addiction. State officials spend millions of dollars each year to combat the opioid epidemic. Now, the private sector is stepping up, led by big players such as Partners HealthCare and General Electric. Now she works to help others when they end up at the hospital. “If you had told me four years ago that I would be standing in front of all you people, I would have told you you were completely insane,” McMahan said. McMahan’s story provided an optimistic counterpoint to grim statistics. State officials estimate nearly 2,000 deaths statewide last year could be attributed to opioid addiction. RIZE’s origins can be traced to discussions that Partners chief executive David Torchiana had within his organization, including at MGH, a Partners hospital. Over time, several other top health care executives joined the effort. The RIZE board includes Boston Medical Center chief executive Kate Walsh, philanthropist Jack Connors, 1199 SEIU executive vice president Tyrek Lee, and Blue Cross Blue Shield chief executive Andrew Dreyfus. David Barash, the GE Foundation’s chief medical officer and a board member, said he expects that the funds being raised could go toward the full continuum of care from prevention to recovery, and toward developing novel treatment methods that could be replicated and exported to other states. As part of its move to Boston from Connecticut last year, GE committed to spend $15 million on local public health causes during the next five years. Some of that money is being used to improve addiction care at community health centers. GE also sponsored a “hack-a-thon” in September with MGH to encourage teams to come up with innovative approaches to the opioid epidemic. GE’s donation to RIZE represents a natural continuation of that work. Connors, cofounder of ad agency Hill Holliday and a former Partners chairman, also stressed the need for more Massachusetts companies to help combat opioid addiction.